What’s the best thing about Star Wars? If your answer isn’t the audio then we’re at a bit of an impasse. No franchise has as many memorable noises as Star Wars, especially not ones that even people who haven’t seen the film can mimic – from Chewbacca growls and TIE Fighter screeches, to the hymnal quality of John Williams’ score and the devastating sound of a Void-7 seismic charge. 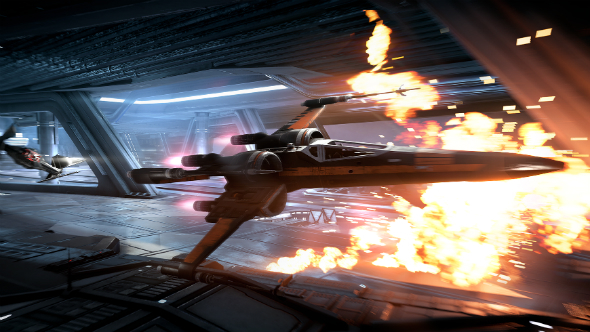 Save for Chewie, you’ll find each of these wonderful sounds in Battlefront II’s Starfighter Assault mode, which oozes with all the familiarity and throwback charm that fans have come to expect from every new venture into this beloved IP. Criterion Software have nailed far more than the sound design, though. 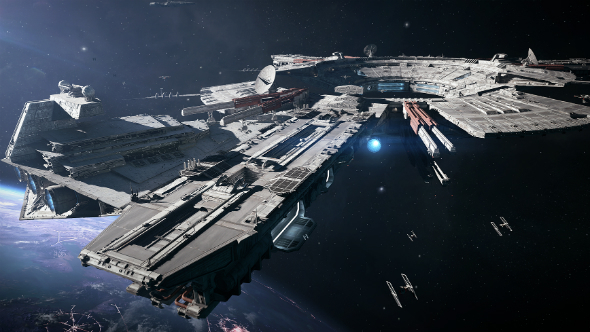 This is a space combat sim that could be boxed and sold on its own – nobody tell EA. Interested in more than space battles? Here’s what we know about Star Wars Battlefront II’s release date, campaign, and heroes. Starfighter Assault is an objective-based game mode that will be immediately recognisable to anyone who spent the end of 2005 scrambling X-Wings in that other Battlefront II game. The attacking team has a number of objectives to destroy across three phases while the defending team have to stop them. The map is Fondor Shipyards and the Rebel Alliance are on the attack, hoping to eliminate the titular docking station’s defences so they can blow up a Star Destroyer that’s receiving repairs at the base. The first phase is the most immediate. 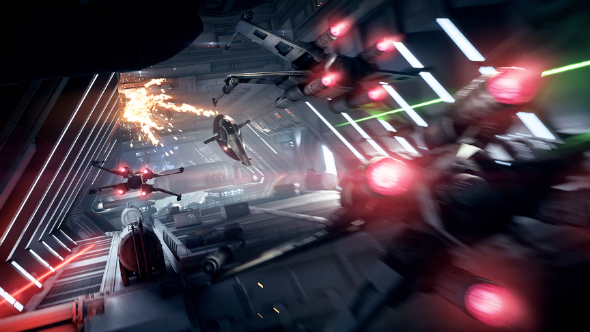 Straight from spawn you’re facing off against a pair of Imperial Light Cruisers that need to be neutralised before you can start tackling the shipyard’s defences, juggling strafing TIE Fighters and the cruiser’s turrets along the way. Next up are a trio of shield generators which, owing to their distance from spawn, tend to favour a stealthy approach. Finally, you have to explode a reactor and some support beams. All of this has to be done before the Rebel Alliance run out of respawn tickets, so every death counts, which makes those accidental crashes even harder to stomach. Ships come in three flavours: heavy, medium, and light. For the Rebel Alliance that equates to lumbering Y-Wing bombers, stalwart X-Wings, and nimble A-Wings. 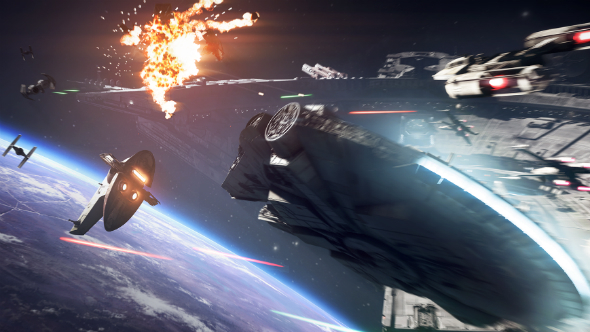 On the Empire’s side, expect to see the TIE Bomber, Fighter, and Interceptor fulfilling identical roles. Hero ships are still the star attractions, with rebel scum getting to pilot the Millennium Falcon and even Poe Dameron’s Black One X-Wing once they’ve racked up sufficient points. Meanwhile, skilled Empire pilots can take Boba Fett’s Slave I or Darth Maul’s Scimitar into battle. 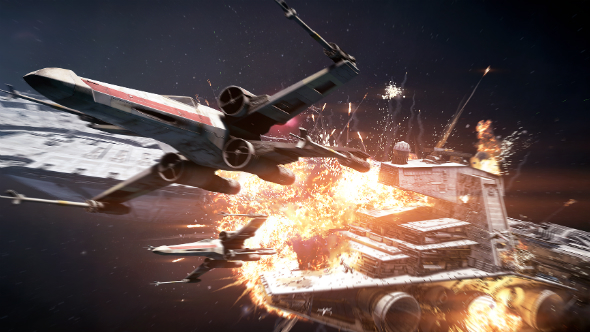 While there’s not much difference between a TIE Fighter and an X-Wing in Battlefront II, Hero ships boast distinct arsenals, health values, handling, and abilities. The Millennium Falcon, for example, is a tank that’s adept at taking down objectives and shrugging off strafing runs with ease. It’s also surprisingly manoeuvrable, with a stomach-emptying ability to slow from full speed, perform a Split S turn, and boost away within a couple of seconds – just as in the movies, this relic outperforms anything in an aerial ballet. Black One is a little underwhelming, but still a game-changer in the right hands thanks to its buffed health and damage stats, not to mention a stat-boosting aura that helps nearby friendlies. I didn’t get to use any of the Empire Hero ships during the few matches I played at Gamescom 2017, but there’s no mistaking their arrival on the battlefield. Darth Maul’s Scimitar can cloak, allowing its pilot to lose any tails with ease, only to reappear behind them and open fire with its powerful cannons. Boba Fett’s Slave I, meanwhile, can be heard wherever you are in the map thanks to its Void-7 seismic charge, an area-of-effect attack that’s lethal in close-quarters scraps. My favourite of the three standard Rebel picks is the sprightly A-Wing, which comes into its own towards the end of the match where the objectives are smaller and you’re forced to fly through internal sections of the docking station. These tunnel sections are navigable for all ships, but the A-Wing can fly through them without having to slow down, darting inside for cover or to lose a tail. Its modest payload makes destroying anything hard work, but it more than makes up for this with its sheer manoeuvrability, which allows you to slowly chip away at objectives and enemies without risking a valuable respawn ticket. The caveat is that they’re easily picked off in open areas, making them practically useless during Fondor Shipyard’s opening attack phase. Piloting the A-Wing also accentuates all those qualities that have made space battles such a pillar of the cinematic franchise, channeling the same sense of scale as the Death Star trench run from A New Hope. Weaving between the supports that are the target of the map’s final phase, as bigger enemies fumble their way through the perilous obstacle course in pursuit, it is as close to the original trilogy as gaming has so far allowed – right down to the inexplicable pyrotechnics that erupt from any ship you manage to blow up. Dogfighting is set against a rolling backdrop that goes something like this: blinding white light, imposing capital ship, separate dogfight, dark side of planet, inky black of space, explosion. Often, that last part was me. Intuitive flight controls underpin the audiovisual feast. It only takes a matter of minutes to get a feel for space combat, which differs ever so slightly from Battlefield’s fighter jets in as much as you don’t have to concern yourself with directions like up or down. Space brings out the best in prospective pilots, there’s no speed penalty for climbing, no proper limit on where you can fly, no momentum to manage, or g-force to wrestle with. Battlefront II embraces the setting, giving you the ability to perform instant u-turns and go from full speed to nearly still in a couple of seconds. Pitching and rolling are just as twitchy, enabling aggressive players to change course the instant a new target appears. The shooting itself feels a little damp, but no developer to date has managed to make laser weaponry seem appropriately fierce. Rockets and torpedoes, however, are a constant pleasure to unleash on targets, the crackling rattle and fizz of their exhausts the stuff of nostalgia-driven fantasy. Leading a perfect strafe of laser-cannon fire on a turning enemy would be a lot more satisfying if it was done without a reticle telling you precisely where to shoot. In fact, if there is a criticism to land at Battlefront II’s cargo bay doors, it’s that space battles are too refined, absent of any Lucas-inspired madness. Unlike 2005’s Battlefront II, you can’t fly your ship into an enemy hangar and blow all their fighters up – there’s no leaving the cockpit in Starfighter Assault. But while there’s less opportunity for improvisation, the setup works to the benefit of the game mode overall, focusing everyone’s attention on the objective. This is Star Wars in its purest, most fan-pleasing form, and that’s a huge relief for fiction devotees who are still coming to terms with the existence of Episodes I-III. Space battles suit this straight-faced approach – the high levels of polish only add to the experience. And it really is an experience, on par with seeing an IMAX screening of a summer blockbuster – impressive on a visual, aural, and tangible scale. I think it even smelled good. Exactly how much those qualities matter to you will depend on how much you enjoy the films. Personally, that’s enough to spend a few hours dogfighting with TIE Fighters, which seems about right for a game mode that’s one small part of a big package.